Is Your TV As Good As You Think? What’s in Store this Summer? It’s always good to see the warm weather returning, and with July creeping closer, 2018 is really racing by. In this month’s ClassAction.org newsletter, things continue to heat up – especially when it comes to the products you use every day. Are you getting the TV you paid for? Are you being charged too much interest on your store credit cards? Is that baby monitor even working? Important questions with surprising answers. Read on, and enjoy! Whether you’re into the World Cup or Game of Thrones, television’s never been more exciting – but are you getting the picture quality you paid for? 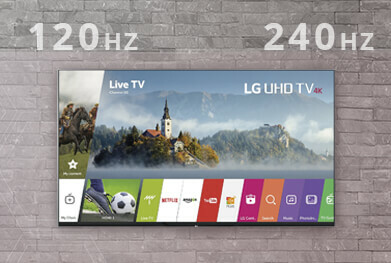 Attorneys working with ClassAction.org are investigating claims that certain LG TV sets offer refresh rates of only 120Hz and 60Hz, even though they were advertised to offer double that number. A refresh rate defines the number of unique images appearing on the screen every second, meaning televisions with lower refresh rates have a poorer quality and less crisp image. Not only that, TVs with lower refresh rates are normally sold at a lower price. So, if you’ve paid for a higher-quality picture, and aren’t actually getting it, you may be able to take action and get back any money you overpaid. When products are mislabeled, it harms consumers and makes it difficult for people to be certain they’re getting what they pay for. So, stand up and take action – and click here to learn more about what’s going on and what you can do about it. Is Progressive’s Snapshot Device Messing with Your Vehicle? If you’ve signed up for Progressive’s “Snapshot” program and noticed problems with your car’s battery or electrical systems, you’re not alone. A number of drivers have complained online about problems with their cars that seem to be linked to the Snapshot device, and attorneys are now looking into whether a lawsuit can be filed. It all boils down to the way the device is powered. Attorneys suspect that the devices are continually drawing power from the car’s battery – even when the car isn’t on – and that this can lead to dead batteries and other electrical issues. Problems already reported by Snapshot customers include car alarms failing, cars overheating, the inability to change gears, cars shutting off while on the road and, of course, cars failing to start and needing a jump. If you’ve experienced any problems you think stem from your Snapshot device, get in touch to learn how a class action lawsuit could help you. We’ve looked before into deferred interest store credit cards, and how many stores seem to charge interest on entire balances even if only one dollar is left unpaid at the end of the interest-free period – and now we’re back, naming names. Stores including Apple, Kohl’s, Home Depot, Sears, Kay Jewelers, Saks, and many more (you can see the full list on our dedicated page) may still be illegally applying interest to the entire purchase balance even after payments have been made. If this happened to you, attorneys working with ClassAction.org would like to hear from you. A lawsuit may be able to help get back any money you overpaid in interest and force these companies to give up the alleged practice. You can read more about what’s going on and get in touch with us right here. Our settlements page is always being updated. Have you checked to see if you're covered by any open class action settlements? Patients who underwent cardiac procedures at Penn Presbyterian Medical Center between October 2013 and December 2015 may have been exposed to mycobacterium chimaera – a form of non-tuberculous mycobacterium (NTM) – according to a letter sent by the hospital in September 2016. The source of the infection risk is believed to be a specific surgical device, the Sorin 3T Heater-Cooler System, and attorneys are investigating whether a class action lawsuit can be filed against the device’s maker for patients who haven’t been diagnosed but need to spend time and money monitoring their infection status. The hospital and its medical staff are not under any sort of investigation – but the manufacturer of the heating and cooling device is already facing dozens of individual lawsuits from patients diagnosed with NTM. Read more. What’s better than a steady stream of easy-to-read blurbs on class action lawsuits filed in federal court? A searchable database of these lawsuits, of course – which means we have some good news for you. ClassAction.org has launched a fully searchable database of all the class actions covered on our newswire, making it easier than ever to find the cases that matter to you. Dozens of new cases are added every day, so head on over to the site to check it all out. Keep in mind this is more of a research tool than anything else, and should not be confused with our list of open investigations and lawsuits. Netgear, Inc. is facing a proposed class action after frustrated parents claimed the company’s much-lauded “all-in-one,” “hyper-connected” baby monitor left much to be desired. The monitors were apparently sold with the promise of a to-be-released tablet that could connect to the monitor without an Internet connection – but as time goes on and the tablet remains unavailable, parents have found the monitors essentially useless. No refunds have been offered so far, though Netgear did apparently offer coupons for an Amazon Fire HD 8 Tablet as an “alternative.” The proposed lawsuit seeks to cover a nationwide class of consumers. Read more. Is the Apple Watch all it’s cracked up to be? “Crack” may be the key word there, as the company’s facing a new lawsuit over allegedly defective watch screens in its Series 0, 1, 2 and 3 models. Users have complained that their watch screens have cracked, shattered or completely detached, sometimes after only a few days or weeks of use. The complaint claims that Apple knew about the problem even before shipping the watches and has a policy of denying the defect, trying to place the blame on “accidental damage” despite huge numbers of complaints made online and in store. Learn more. A judge in Massachusetts has tossed out a suit filed by three women who suffered side effects after taking a generic version of GlaxoSmithKline’s nausea medicine, Zofran. The women argued that GSK “created the market” for the drug and were thus liable for the generic medication as well as the company’s branded drugs – though they failed to convince the court. Responding to the ruling, GSK reiterated that the company did not feel it could be held accountable for products it did not manufacture. Zofran has been the center of several lawsuits over its alleged link to birth defects when taken by pregnant women. Read more about Zofran.